I know some people are not happy with The Desolation of Smaug. I’ll start my review by saying that I have read The Hobbit yearly since 1973. I’ve read The Lord of the Rings yearly since 1971. I love the books and the stories. I also love Peter Jackson’s telling of those tales. So when I went to see a double-feature of The Hobbit to include AUJ and a midnight, first-time viewing of DOS, I went without the book as my expectation and eager for the adventure into Middle-earth as only Peter Jackson, Philippa Boyens and Fran Walsh can serve. I was not disappointed! This film is excellent, imho! I’m not saying there weren’t moments that I thought could be different or left out altogether, but WOW it was great! I’ve been to see it 4 times so far, and each time I notice more. I was worried about Beorn; but found the character mystical and effective. I was worried about the spiders and Mirkwood; but OMG! 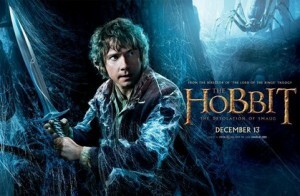 Bilbo’s actions and reactions to all he encountered there made me laugh, then gasp, then shudder, then tear-up. Martin Freeman is showing his firm grasp of this character and a depth of emotion with every expression, gesture and word. Bilbo’s growing realization of and relationship with the Ring and with Thorin is complex. The dwarves’ personalities are more evident as each one’s unique strengths galvanize the Company and their Quest. Then, Jackson took me off into the unknown journey I was counting on! I loved not knowing what was coming next while still couched in the familiar. The Company’s capture by the elves, Legolas at the beginning of his own growth, Tauriel (wonderful! ), the barrel-ride (awesome! ), Lake-town, Bard’s life all really sent me off into a new experience. Gandalf’s incredible confrontation in Dol Guldur was uncharted territory and so intense! Then… there’s the Mountain. I was blown away by what happened in that decimated realm. Not just by the brilliance of Smaug, but from Bilbo’s encounter all alone down to the dwarves eclipsing what they did in the book had me cheering!